It can’t stay winter forever. At least that’s what we fervently hope every February or March as the bitter winds blow and the snow clouds roll in day after day. The first time you shovel or don a winter cap it feels exciting and new. But months into a Midwestern winter you begin praying for signs up Spring. The darkness and dreary skies, the depression of it all gets so old after a while. And that is how it is for our souls. There are seasons for our souls, periods of falling snow and freezing temperatures that make you want to curl in on yourself. The days feel short and clouded with darkness. But then you turn to Jesus. Those long, dark days continue, but the way the Lord meets you in your sorrow is like sun to a dying flower. He speaks to you almost audibly, you pursue new spiritual disciplines: any way to possibly connect with his goodness. Not my will but Yours be done. You try to convince yourself you believe those words. But your soul knows the truth. Your dream is still your priority and you’re kinda-sorta trying to manipulate the God of the universe into doing things your way. More years pass, appointments come and go, hope fades. But then that same relentless grace offers you freedom and a new hope. You lay down your desire once and for all and you mean it this time. You truly expect nothing in return, and trust the Lord to write you a beautiful new story. 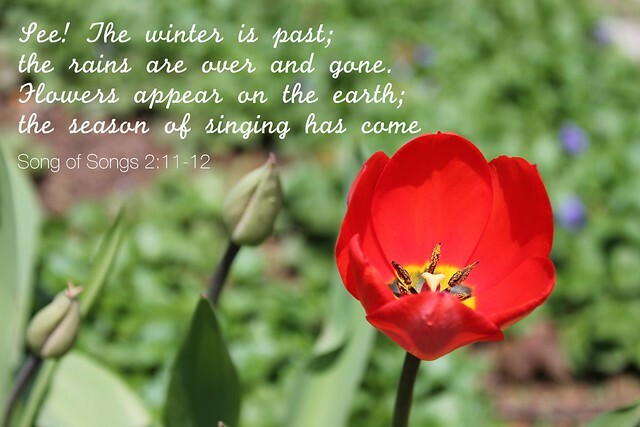 When you look back over all those years of winter you see what God has done in you. He has taken you a few steps further away from your selfishness, your faithlessness. He has shown you glimpses of your gifting and your calling to ministry. He has filled you with a new confidence. He has given you a new heart for the broken people around you, a new sensitivity to the hurt in their eyes, and a new way of being their friend. But God’s goodness trumps all. And you weep. You weep because He said yes. You weep because he has called you faithful. You weep because He healed you. You weep for the new story the Lord Jesus is writing for you, the way the colors of summer have sprung boldly into your life, a beauty beyond imagine when you’d been reluctant to leave the winter. I wrote about similar topics twice before – The New Land and Hindsight is 20/20.